People who put even a small amount of money into a savings account as often as they can and leave it untouched for years may be amazed at how big the account grows. The reason? A combination of saving as much as possible on a regular basis and the impact of interest payments (what the financial world calls "the miracle of compounding"). Here's how you can slowly build a large savings account and experience the miracle of compounding. Let's say you put money into a savings account that pays you interest every month. After the first month, the interest payment will be calculated based on the money you put in. But the next time the bank pays you interest, it will calculate the amount based on your original deposit plus the interest you received the previous month. Later, that larger, combined amount will earn more interest, and after many years it becomes a much larger sum of money. The earnings are called compound interest. You can earn even more in compound interest if you make deposits regularly and stretch to put in as much as you can and leave it untouched. See the chart below, which is based on a savings account started with $50 and earning interest at a rate of 3.5 percent each month. If you add just $10 each month, the account can grow nicely to $714 after five years. If you instead put in a slightly higher amount—$15 each month—you'd have a balance of $1,042 after five years. 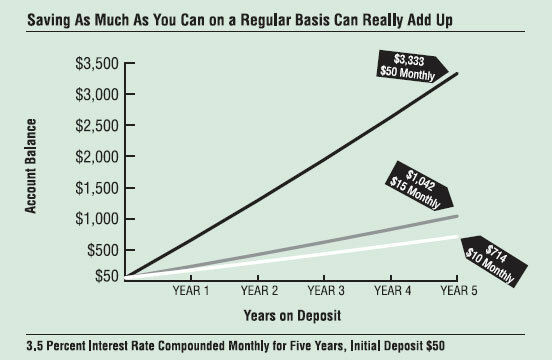 But if you had increased your deposits to $50 a month, those extra dollars plus the compounding of interest would give you a balance of $3,333 after five years.